You can trust our all-natural herbal syrup to give temporary relief from the scratchiness associated with sore throats and coughs. Cayce meant for this formula to provide a healing through the whole system. 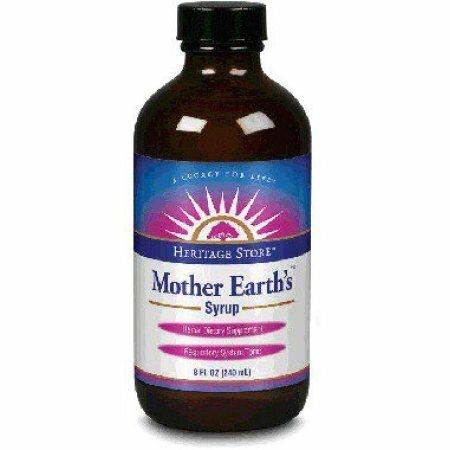 [243-29] Mother Earths is a therapeutic combination of horehound, which soothes irritated mucous tissues, wild cherry bark to alleviate respiratory distress, rhubarb, which cleanses the system, and elixir of wild ginger for toning the digestive tract, preserved with grain alcohol in a honey and syrup base. This gentle, pleasant-tasting tonic is safe and effective for children and adults, just as Mother Earth intended. One Tsp contains: Calories 15 (from fat, 0) Total Carbohydrates: 3 gm (1%RDI - based on 2, 000 calorie diet) Wild Cherry Bark Syrup: 900 mg * Syrup of Horehound: 350 mg * Syrup of Rhubarb: 350 mg * Elixir of Wild Ginger: 350 mg * *% Daily Value not established. Other Ingredients: Water, Alcohol and Honey.